Breakeven Analysis – The Markens Group, Inc.
Now, to answer the original question, examine the table. To solve for the formula, first find the difference in total makeready dollars. Then calculate the cost per carton on each production center to five decimals (the variable machine hour rates divided by the standard run speed). Subtract the second answer from the first. 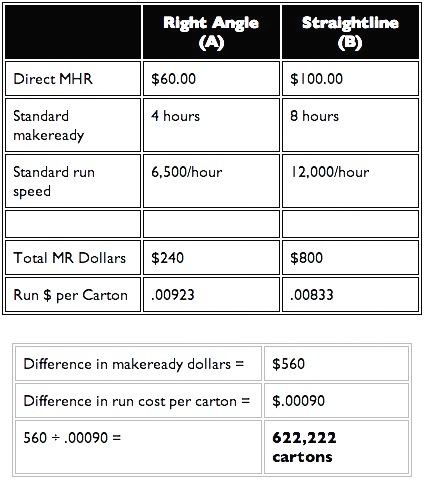 Finally, divide the increase in total makeready dollars by the difference in the run cost per carton savings to arrive at the breakeven quantity.